Check for a good seal where the chimney passes through the roof. If its base is sealed with mastic or tar (black substance), check for openings. Seal any found. Check for any rust. If found, clean the affected area with a wire brush, wipe the rust away with a rag, and apply a spray-on rust inhibitor (like Rustoleum) to seal the metal. When you buy rust inhibitors, the color of the cap on the spray can will be the color the cap ends up. These pipes have two walls. If the outer wall is rusted through, have an Heating and Air Conditioning company come replace it. Make sure the bonnet or top of the chimney is secure and cannot come off in the wind. If it is loose, secured it using sheet metal screws. Apply zinc-based moss powder to keep moss from growing on roof. Check for loose mortar joints and loose bricks. These mortar joints can be tuck-pointed by you if you are comfortable with mortar use or by someone else if you are not. 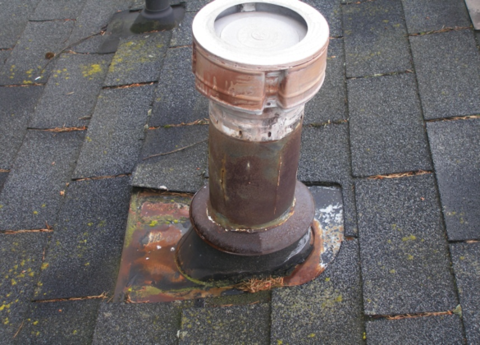 Check the condition of your chimney cap. This is a flat piece of concrete or metal that seals the top of your chimney chase closed from the elements. If it is a one piece concrete cap, check to make sure the outer edges of the cap overhang the top outside edges of the top row of bricks. Also, make sure it has no cracks in the concrete and that it seals tightly where it butts up against your chimney flues (the "pipes" that carry smoke, carbon monoxide, etc.). Seal cracks in the cap with concrete crack filler. Seal any openings against flues with exterior caulk. If the cap is in bad shape, you may need a new one poured. If the cap is metal, check for rust and for a tight seal where flues pass through the cap. For rust, clean the affected area with a wire brush, wipe the rust away with a rag, and apply a spray-on rust inhibitor (like Rustoleum) to seal the metal. When you buy rust inhibitors, the color of the cap on the spray can will be the color the cap ends up. Install a rain cap if you don't have one. This will keep birds, etc. out of your chimney flues and it will keep rain from rusting and damaging your metal damper if you have one in use. Clean gutters out completely. Pick out large objects / organic matter (pine cones, braches, etc.). Wash the remainder down your downspouts using a garden hose (not a pressure washer). Check anchor nails at rafter tails for stability. Make sure all downspout sections are still connected to each other and that anchor brackets have not pulled loose from the home's siding. Make sure that splash-blocks, if used, are set to catch water as it comes out of downspouts and angled at least ¼-inch per foot of travel downhill away from the home to properly route water away from the home's foundation. Check lap siding (named because each board overlaps the board underneath it as siding goes towards the ground) for any splits, loose nails, etc. Put loose nails back with a hammer, and then caulk the nail heads shut. Check panel siding (sold in 4 x 8 foot panels) for proper seals where two panels meet each other. Make sure there is a 6-inch gap between soil and the bottom edge of the lowest siding board or wood trim. This prevents wood rot and insect damage. Re-secure any loose trim pieces so winter winds cannot damage them or remove them from the home. Check caulk joints where siding boards meet each other and where siding boards meet windows. Re-caulk any areas that have come open. Remove old caulk before doing so. Cover your hose bibs with insulated covers. This not only can keep your water lines from freezing up in a severe winter cold snap, it can keep the hose bib shut-off valve from being damaged. This damage commonly leads to a dripping or leaking hose bib that cannot be shut off.